In November 2017, I had the privilege of working with Rosemary Bell, Community Development Officer for the City of Toronto Canada and Amanjot Gill, Mental Health and Addictions Clinician originally based in northern British Columbia, Canada. In conjunction with the Toronto Strong Neighbourhoods Strategy 2020, Rosemary and Amanjot were focussed on the co-creation of a Leadership Development Training pilot program for higher education students on placement in areas including: social development, finance and administration. In this issue of AI Practitioner, Rosemary and Amanjot provide an overview of their work with these students as well as further application of an appreciative approach in other settings. Every fall I get the opportunity to work with new placement students from a variety of educational institutions in the city of Toronto where I work as a Community Development Officer for the municipality. As part of my orientation with them I share the frameworks used in my community development work rolling out the Toronto Strong Neighbourhoods Strategy 2020. These frameworks include: anti-oppression, asset-based, strength-based, solution-focused practices and last but definitely not least, appreciative practice frameworks. As a person who has been working for more than thirty-five years in my field, it is always interesting to dialogue with students about why my practice has evolved and expanded over the years; I am exposed to new approaches that have practical applications in both my professional and personal life. In the fall of 2017, Amanjot Gill, a Masters of Social Work candidate from the University of Toronto, joined me for her eight-month practicum placement. She came from the Social Work Leadership and Management stream of the Masters’ program. While she was aware of and using many of the practice frameworks previously mentioned, the appreciative practice framework was new to her. We noticed that the students were very quiet over the first few months as we got to know them and each other. We realized that many of them were a little hesitant and unsure of themselves. Their lack of confidence was surprising. They had achieved a placement with the city government, yet some of them felt like imposters who were just waiting for someone to realize that they didn’t belong. It was at this time that I saw an article in the August 2017 issue of AI Practitioner by Keith Storace, a registered psychologist in Melbourne Australia entitled “Appreciative Dialogue: Managing Self-doubt Through Inspirational Discourse”. Keith’s work focused on self-doubt in higher education students. A little voice in my head said reach out and ask for help, so we emailed Keith and asked if he would share his expertise with us. Lucky for us, he said yes. Using Skype and with some careful juggling of time zones, he worked with us in November 2017 to craft a series of questions that focussed on past, present, and future along with developing a workshop specifically targeted toward our group of students. What are all the things you can think of that made your study pathway possible? What is one of the best experiences you can think of that involved working on something with a group of people and what was your role? What was a challenge you experienced in the past that had a positive outcome? What did you do and what did you learn? What are some of the things that you do well? What are some of the key things you value most about your area of study? If you had one desire for the future in relation to work, what would it be? How will you know that things are moving in the right direction for you in relation to work? If you could change one thing about yourself, what would it be and how could some of the experiences you mentioned in your answers above help you achieve this change? What are some of the things that came up in your pairs? What have you learned from sharing your story with your partner that came up in terms of self-doubt? What do you feel you have achieved in life with the strengths and desires that you have? We then flip-charted the key themes that came out of this discussion and addressed similarities in their lived experiences. “There is no failure, only frustration” – If you consider your so-called failure as an inconvenience or frustration, rather than a failure, and use it as part of a personally creative and innovative process, you stand to gain more rather than experiencing it as a loss. 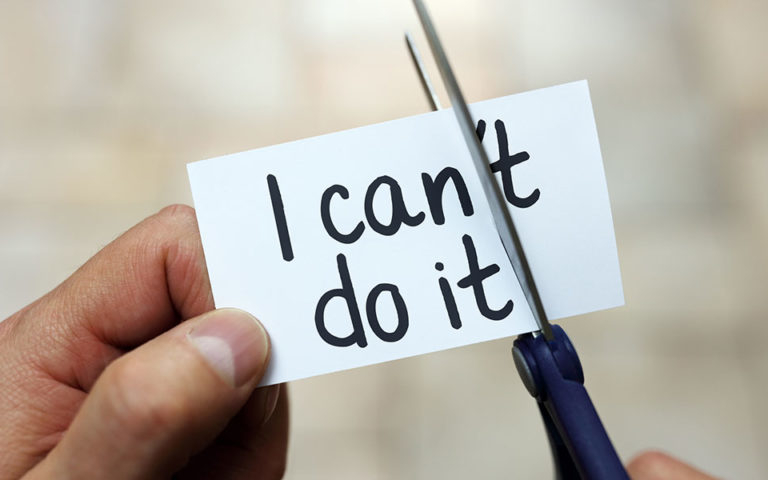 “Self-doubt will not stop you, self-denial will.” – Self-doubt will not necessarily stop you from achieving something whereas self-denial is more likely to prevent the successful outcome you are working towards. This is because, in essence, self-doubt is a feeling and self-denial is behaviour. A youth focus group of seventeen participants and a senior focus group of five participants were conducted from March to April of 2018. As well, nine resident interviews with youth, adults and seniors were held. These interviews took place in a variety of spaces in the community of Jane and Finch. We asked residents to share with us their hopes and dreams for their family and community. This community has been studied often and as a result feels violated by the process. We shifted the dynamic by exploring how their ideas, skills and projects are supported in their community. We also asked them what currently works well in their neighbourhood. The information we received from residents has been summarized and will be shared with them, other networks and planning tables. The intent is to follow up on the ideas generated and suggestions for more functional ways to provide services, meet needs and shift the stigmatizing narrative by highlighting their community assets. We have expert knowledge, gained through lived experience, of the challenges in our communities and we are have the solutions. We’ve got ideas to make our neighbourhoods stronger, healthier places to live, help us make them happen. We want our community to reflect the strengths, assets and creative capacity of its residents. The City has responded with neighbourhood grants for resident groups. What are your best experiences in your community? What important local wisdom can you share today? Share the creative concept/new idea that you need funding to make happen. How will you focus this new opportunity? How will you use your energy to spark positive change in your community? Who do you need to build partnerships with? How will you build your budget? How will you reach out to residents and other community members? Where will you hold your event? Have you thought about insurance and/or permits for space? What other things do you need to do? In conclusion, Amanjot shared that she will be moving forward with a strong tool and approach that she can use in future work place settings. She said that the use of Appreciative Dialogue with the placement students resulted in a much deeper and meaningful participation from them in workshops and their placement overall, which was reflected in their evaluation surveys. In turn, she used the appreciative lens during her studies in university, recognizing that this was beneficial to both her personal and professional development.